Did you know why CAD Designers love using our software? Read these CAD case studies and find out what our users have to say about their experiences. We have asked our users why they like working with Pro/ENGINEER and how the software helps them fulfil their day-to-day job tasks, which we've then presented back to you in a range of CAD case studies. "What I like most about Pro/ENGINEER is the speed with which changes can be implemented. We usually progress through several design iterations during a project until we hit sign-off, and with Pro/ENGINEER, this is as efficient as can be", reports Gavin Burnham, who works as Senior Design Engineer at Vax Ltd., the number 1 floorcare brand in the UK." Peter Lomas has been working with Pro/ENGINEER for almost 10 years now and he has been so impressed with the software that he has introduced it into two companies as he has progressed through his career. 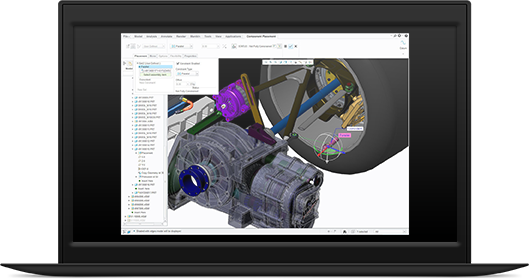 He says: “Since picking up Pro/ENGINEER, I haven’t used any other 3D CAD software – I simply haven’t felt the need, as Pro/ENGINEER does everything I need it to do as a Design Engineer, and a lot more on top!" Paul Heatherington is Lead Designer atBurnside Autocyl, a manufacturer of hydraulic cylinders in Tullow, Co. Carlow / Ireland. The company has implemented Pro/ENGINEER when making the move from 2D CAD to 3D CAD in 2005. "It doesn’t take long to become familiar with the software. "In our business, speed is a decisive factor for success. Modeling in Pro/ENGINEER is very quick. For example, I have just completed a design for a new battery, and the entire design has taken me only three days!" Read on to learn how Allan Turtle benefits from using Pro/ENGINEER.